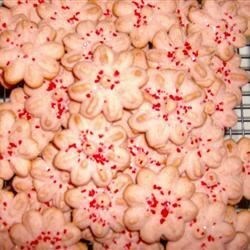 "This one is a soft spice spritz cookie that has been a holiday tradition for over 20 years!" Cream together butter and sugar. Beat in egg yolk, sour cream and vanilla. In a separate bowl, mix flour, cinnamon, salt and baking soda. Stir flour mixture into butter mixture. Place dough into a cookie press and press cookies onto ungreased baking sheets. Bake in preheated oven 10 to 12 minutes, until golden. Cool 5 minutes on sheet before moving to wire rack to cool completely. The ultimate in crunchy topping! My six month old just loved these cookies. My older children joyed them too. Very good and easy to make. I also added a teaspoon almond extract for a different flavor. these were very good! we just rolled little balls, flattened them and topped with a chocolate chip. yum yum!